When we walked around the streets of Kolkata on the very first day, I was struck by the lack of women going about their daily business. But today we had the chance to see what some women get up to for a living. This is the first day we haven’t been to a GNCEM school, instead we headed to ConneXions. ConneXtions is a vocational training centre available to underprivileged women from the Kolkata slums. We were invited in to see their humble head-quarters. We were shown around by Bappy who runs the centre, and he told us all about the work of the women. For the first 6 months they are trained to make a variety of products including greeting cards, gift bags, blankets, scarves, bags and more. Alongside this, they can also learn English, maths and budgeting and take lessons on women’s issues such as exploitation, legal rights, health and hygiene. Many women work part time and can work from home or in centre. They are paid for their work and the project increases the women’s self-esteem and dignity, they become empowered to improve the quality of their lives. 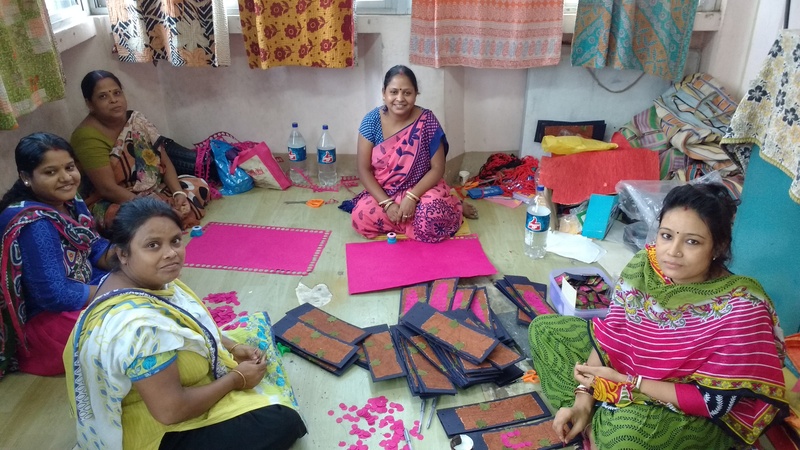 We were able to see these beautifully crafted products and couldn’t help but support them by buying blankets, purses, cards, cushions covers and scarves, all made from recycled sarees. I have a love and have an interest in textiles and to see how much hard work and dedication the women put into their work was inspiring. I was also struck by the hospitality of the women; in fact the whole team have noticed just how hospitable everyone in India is, they just can’t stop giving. Although we invaded their work space they got us all chairs and provided chai tea and food. Another example of hospitality today was the fact that our bus driver and chaperone were super friendly and went above and beyond in getting us to where we needed to be. Even when their work was over, they insisted on taking us on to the next place. This afternoon we went to the New Market. This was a very stressful experience; everyone hassled us to come into their shop. It was hot and busy but exciting. Me and Josie, with help from Emily, successfully managed to haggle for elephant patterned Alibaba trousers. We are very pleased with our purchase! Straight from the New Market, we went to the Entally Girls Hostel, for girls from disadvantaged backgrounds – some were orphans. It was a very run down building. Back in England, we would not expect children to live in such a derelict building, though these girls were so, so grateful for what they had. They sang to us, we sang to them, then they excitedly showed us around their rooms. There were at least 20 beds in one room, some girls were even having to share beds, but they weren’t complaining about this at all. In the short time we were there, we were still able to see how much potential these girls have. They are strong and beautiful. But more than this, they know they are strong and beautiful and that they deserve to flourish in this world. It humbled me to meet them. Today we have met some truly amazing women.